#Kilifi : Governor Amason Kingi with his 7 MPs spoke with a similar tone that there will be no Elections in Kilifi county. -Kaloleni - Bana Kenya News, Real African Network Tubanane. The Kilifi Governor Amason Kingi went round with his MPs for thanksgiving in all Kilifi sub-counties. 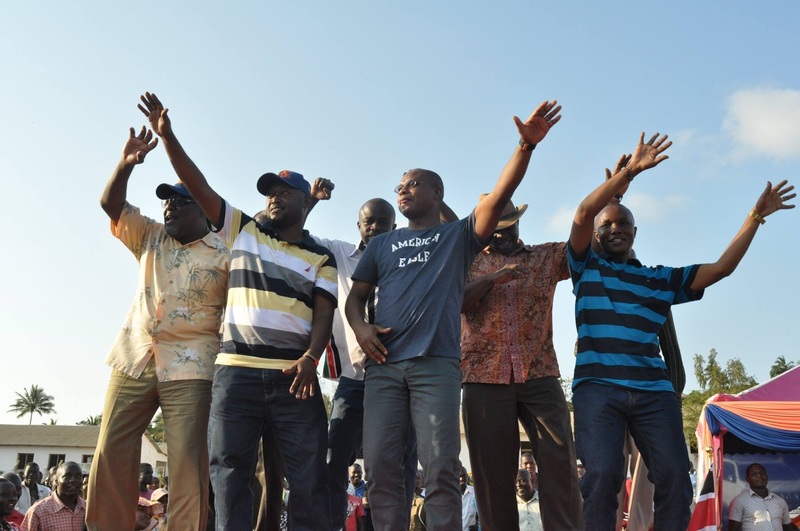 In Company of Ganze MP Teddy Mwambire, Kilifi North MP Owen Baya, Kilifi south MP Ken Chonga, Rabai Mp William Kamoti Mwamkale, Kaloleni Mp Paul Katana Magarini Mp Michael Kingi among others, Governor Kingi urged the People of Kilifi that now all leaders are united and ready to serve them. "There are no elections in Kilifi county, I have all my 7 MPs who will spearhead the No reforms, No Election slogan. We have to speak in one voice to make sure our county rises. Today I seat with my brother Hon Teddy Mwambire speaking with one voice of which I never happened with the former Mp Peter Shehe. " he said.
" We have almost all MCAs in our way and we will deliver to you our people" he stated. "We have authentic and legit reasons as to why we as NASA are boycotting the October 26th presidential elections. The IEBC itself has confirmed to Kenyans that it cannot meet our basic expectations of a credible presidential election." he said. "NASA under the Rt. Hon Raila Amolo Odinga will not relent in the fight for justice. We will keep on pushing for the implementation of reforms within the electoral body until the IEBC is capable of conducting a free, fair and credible election exercise that will fully reflect the supreme will of each and every Kenyan." he stated. "We will not take part in a shambolic election and mock our democracy. Reforms are mandatory in the IEBC. No reforms, no elections." "Thanked the people of Kaloleni and Rabai Sub-Counties for supporting us in the August 8 election." he said. Governor Kingi speaks after the Mombasa Governor Ali Hassan Joho who said that Mombasa county residents will not go for elections. The Kilifi Governor Amason Kingi laid a plan on the development of Kilifi county and he said to leave a legacy in the county as the first Governor of the County. The Kilifi residents will be looking for the MPs and the other leaders on who lead Kilifi after the reign of the First Governor Amason Kingi. The ball into the current leaders who will take the hearts of Kilifi residents as the Governor will go for Presidency in 2022.